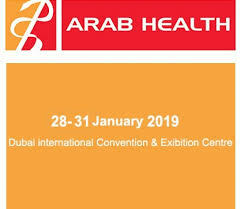 EWAC Medical | Water treatment for hydrotherapy pools. The Aquacontrol compact filtering unit which can be applied as well for the butterfly baths as the rectangular pools. The Aquacontrol filters the water, brings it to a pre-adjusted water temperature and disinfects the water. Through a mounted time clock a program can be set when the Aquacontrol is operational. 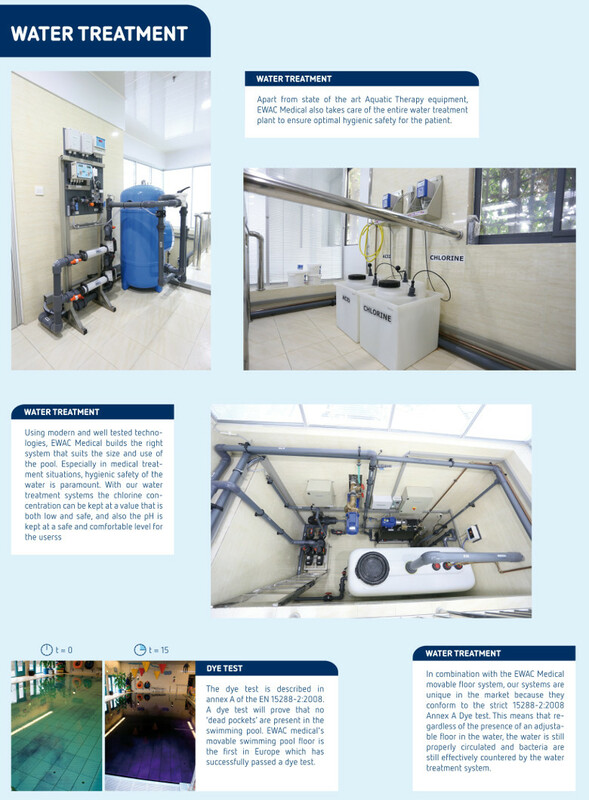 When there is a big load on the bath, or to maintain a constant level of chlorine, the Aquacontrol can optionally be equipped with an automatic measure and control panel for the chlorine. The pH-value can be read, but is not automatically corrected if necessary. 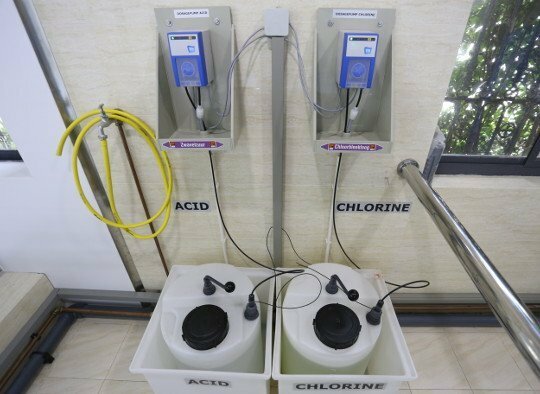 By this optional control, the free chlorine value can automatically be maintained at the right, pre-set, level. This guarantees an optimal disinfection of the water. The Aquacontrol filter unit is connected directly to the EWAC butterfly bath or rectangular pool by flexible hoses. This is only possible for types 4 and 5 of both baths/pools. Thus, the Aquacontrol stands against the butterfly bath or rectangular pool, so that it forms a whole. 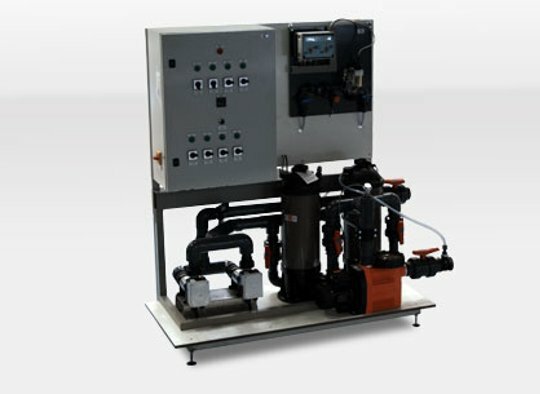 The Aquacontrol consists out of a circulation pump, a pattern filter, an electric heat exchanger, dosing pump, a storage tank for chlorine, a relay and a control cabinet. Switches for choosing manual control can be found on the control panel. 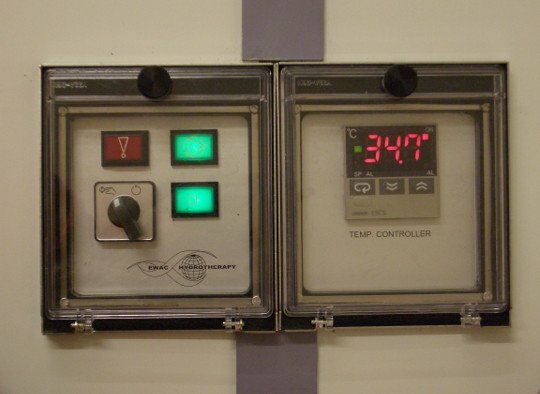 With manual control one gets the possibility to turn off the circulation pump and/or dosing pump, or make a decision between automatic control, so that a mounted time clock takes over switching functions. This way, the Aquacontrol can be turned off, for example, two hours after closing time and turned on 2 hours before opening time. This way, one can realise a serious safe on energy. Furthermore, several safeguards have been implemented: when the circulation pump does not work, chlorine cannot be dosed and heating is also turned off. Also, the pre-set temperature is continually guarded, and the water is heated if necessary. In case of a possible overheating the Aquacontrol also has several safeguards. The outer plates of the Aquacontrol can easily be removed, so that it creates a good access for cleaning and/or maintenance. 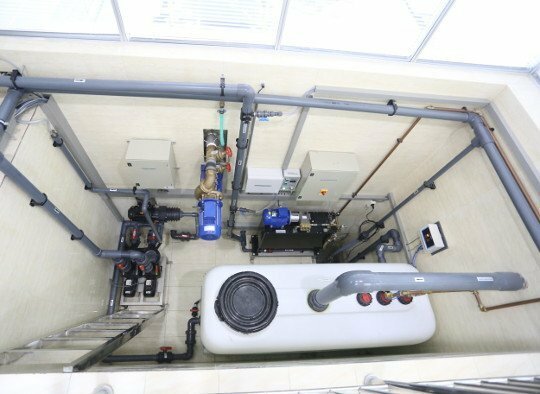 Because of the easy removal of the outer plates, the filter pattern can also be removed from the tank so that it can be cleaned. 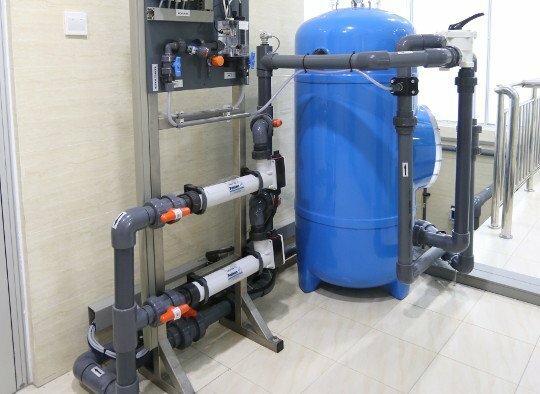 To make the maintenance last as short as possible, EWAC delivers a second pattern filter so that the filter can always be cleaned in a later stage, and later on stored.